We’d love your help. 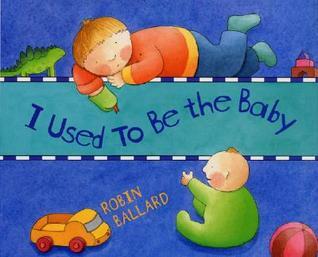 Let us know what’s wrong with this preview of I Used to Be the Baby by Robin Ballard. To ask other readers questions about I Used to Be the Baby, please sign up. This is a nice book about babies for slightly older children. I read it with groups of 2-year olds and their caregivers. I like that it tells a bit about how the baby is different while also acknowledging that sometimes older kids like to be babied too. Not a really exciting book, but a nice read. This is a good book about becoming an older sibling. It's specifically written about a big brother and a baby brother, but since we're expecting a baby girl I just said "she" whenever the book said "he" about the baby brother, and my 2 1/2-year-old didn't bat an eye. There's very little sibling resentment mentioned in this book, something I appreciate since my child is very excited about getting a sibling and I don't want to introduce the concept of resentment and jealousy if he isn't naturally f This is a good book about becoming an older sibling. It's specifically written about a big brother and a baby brother, but since we're expecting a baby girl I just said "she" whenever the book said "he" about the baby brother, and my 2 1/2-year-old didn't bat an eye. There's very little sibling resentment mentioned in this book, something I appreciate since my child is very excited about getting a sibling and I don't want to introduce the concept of resentment and jealousy if he isn't naturally feeling that himself (yet). The book shows various ways the older brother can help the baby. Funnily enough, some are things my son has already suggested he wants to do for his baby sister when she comes (sing songs to her, blow bubbles for her in the bath tub). I liked how the new big brother has a positive outlook here and likes helping his baby brother. Refreshing because most books on the topic present the new baby as very negative to the older sibling, who then comes around like on the last page. Realistic, maybe, but I feel like that's telling the kid to expect it to be a negative experience. My daughter loved talking about how she would do all the things the big brother does in this book. I recommend it! This book is very simple and is about a young child becoming a big brother and not being the baby of the family anymore. This is good for young kids, especially those who are going to have or already have a younger sibling. The illustrations and words are simple and would be a great book for students who are in the beginning levels of reading. This shows ways the big brother can help the little baby, but also shows the big brother getting cuddles from his mom at the end. This would maybe be better after baby is born, but it's a cute book and we haven't had any about babies for a little while, so I thought I'd pick it up. This was a great one for reading to the soon-to-be-big-brother. I will definitely get it again closer to his/her arrival because it shows all of the things that baby can't do and how a big sibling can still play or relate to the baby. "I used to be the baby but now I am big." Pros: My oldest son likes reading this book. He can definitely relate to being the new big brother. It was a cute book with a happy message. I liked the simplistic style of illustrations too. Thank the lord! A largely resentment-free new baby book that my branch now owns! This new baby does lots of things that could be frustrating for an older sibling, but this big brother knows just what to do to help his baby and keep his cool. This was given to DJ when I was pregnant with A. I think it helped him realize (and me) all the ways he could be helpful with a new baby. I love this book.